Scrittura su argilla e ceramica is a project that collects Poenician, Punic and Neopunic inscriptions on clay or pottery from the central-western Mediterranean. One of its specific goals is "restoring the unity of inscription and its support" (Cavaliere et al. 2014). The database addresses the issues related to the Phoenician alphabet encoding by using Unicode UTF-8 and configuring the MySQL database accordingly. For each inscription a digital image is provided. As of September 2014, the database was not yet available on the Internet, but the responsibles aim to publish it at a later stage of development of the project. Paola Cavaliere, Danila Piacentini, Massimiliano Vassalli. Minima Epigraphica: The Project "Scrittura su argilla e ceramica". 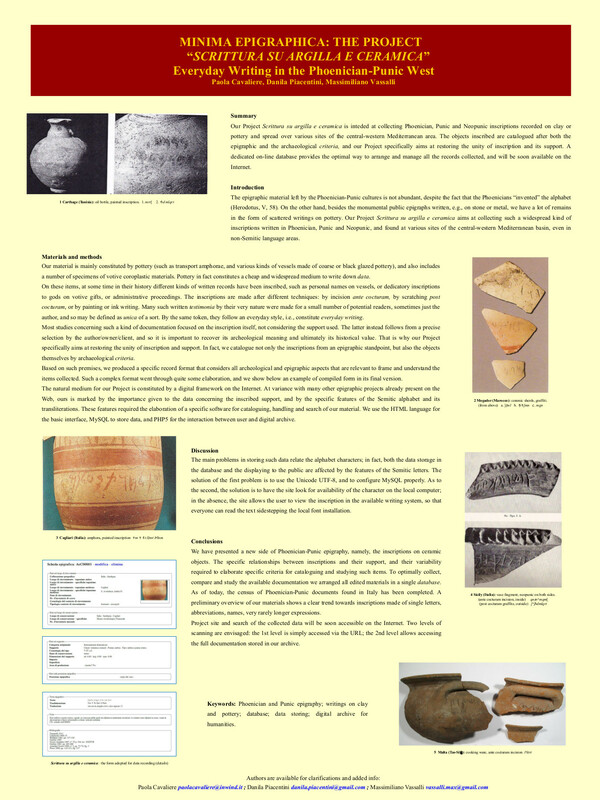 Everyday Writing in the Phoenician-Punic West, a poster presented at the EAGLE 2014 First International Conference (Paris, Sep 29 - Oct 1 2014), in press as of January 5, 2015. This page was last modified on 7 December 2018, at 12:26.